All cardstock came from my stash. I tried to make the inside treasure map like so I used the Invitation Cuttlebug A2 Embossing Folder again and then aged and distressed it using Ranger Distress Ink - Antique Linen. On the inside cover I used the Typewriter Dies for the X, the Cuttlekids 4-Pack Pirate set for the Treasure Chest and the Crop-A-Dile to punch out the pieces of 7 ;-) The treasure chest is covered in wood grain contact stuck to cardstock with detail in gold foil cardstock (not sure it shows well). To get the Treasure Chest to cut right through the foil cardstock and double sided (pre-stuck on back) I had to add two shims of cardstock to the A, B, C sandwich. Lesson learned during this make... put double-sided on the back of the paper BEFORE punching out fiddly, thin or difficult bits. Well this was a whole lot of fun, my 6 year old wants his birthday NOW! LoL. Can't wait for the next challenge. 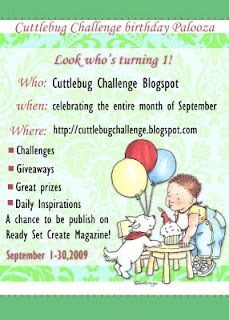 Don't forget to go join in the birthday celebrations at the Cuttlebug Challenge Blogspot! OMG Sarah wow wow wow this invitation is over the top girl I am just awed by all the detail you have added and that ship wow again. Love this invite and how fun it will be to receive that in the mail. Thanks for joining us this week at Cuttlebug Challenge so look forward to seeing more. Sarah! This is fantastic! I do hope we see more with the next Be Inspired challenges in our Birthday Palooza! Thanks so much for playing along! YIKES!! This is so so fantastic..you rocked this challenge, I LOVE every detail! Please come back and play along all month, I dont want to miss out on all the rest of your projects! Thanks for coming to our party at cuttlebug challenge blog! Sarah, this is a great invitation!! (BTW, you made the deadline in plenty of time!!) I am so happy to see that your children are involved in the process, too! I just love the water, the dimension of your ship, and Mickey, too! I can't wait to see what you do next! Thanks for all of your comments on the things we've been showing at Cuttlebug Challenge! We are so glad you are celebrating with us! could NOT love this more, this is fabulous! Sarah this is super duper cute! What a fantastic party invite! Thanks for stopping by my blog today and leaving such lovely comment! Wow, this is just awesome! What a great idea for a for a party too...my boys would love it! I am so loving your theme. Thank you for joining us for the Cuttlebu Challenge.